Choosing a heavy bag can be an important choice in your martial arts training. Get a good heavy bag and you can really develop and hone your striking skills. But choosing a bad heavy bag can be detrimental to your training. 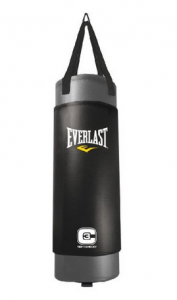 We’ve reviewed some of the top punching bags available and encourage you to check them out for more information. You can also take a look at our complete heavy bag comparison chart. In this article we’ll cover some of the basic information about how to choose a heavy bag so that you can find one to match your training needs. The first choice you should make before looking at different heavy bag options is whether to get a free standing bag or a hanging heavy bag. Both have their positives and negatives, so which option to get really depends on your needs. Below we’ve listed the positives and negatives for each kind of bag. Provide a better striking experience. Tend to move around when struck, so they can help you work on your timing, speed and accuracy. Often cheaper than free standing bags. Can be hard to set up and need a ceiling that can support the weight (or need to buy a separate heavy bag stand). Can’t be easily moved after the bag has been set up. Easy to move: You can set it up in any room and then roll it out of the way when you’re done with it. Easier to set up than a traditional hanging bag. Can be placed on the floor for ground and pound training. Recommendations: The Everlast Polycanvas Bag is a great choice if you are looking for a good and affordable hanging bag. The Wavemaster XXL is definitely our top choice for free standing bags. Click here to see some Century Wavemaster heavy bag reviews. Choosing the right weight is very important when selecting a heavy bag. Choose a bag too light and it could go flying with a powerful kick. But choose a heavy bag too heavy and throwing punches or kicks can hurt your hands and legs. One thing to note about weight is that this rules only applies to hanging bags as free standing bags are designed differently. If you are an experienced martial artist you may want to go with a heavier bag. If you have powerful strikes then you will also want to lean toward heavier bags. Otherwise the bags may move too much when hit with strong kicks and even punches. Recommendations: The Everlast Powercore Nevatear Bag comes in two weight sizes (80 and 100 pounds) and it is a great choice at either weight. 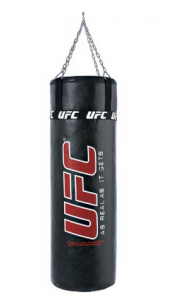 Generally MMA training bags are made from fiber (synthetic and natural), foam, sand or water. Each material has it’s advantages and disadvantages and below we cover the basics of each kind of material. Fiber: Fiber has become one of the most commonly used filler materials. It generally provides a nice even resistance throughout the bag, so no matter where you punch or kick it you should get the same striking experience. Foam: Many top martial arts training bags are made with high-density foam, especially free standing bags. Foam generally provides a consistent striking experience and it doesn’t settle, so you don’t need to worry about bottom of the bag becoming stiff. 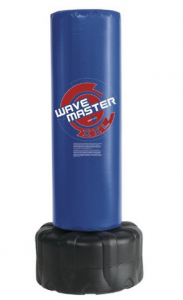 The Wavemaster XXL punching bag is a very highly rated foam heavy bag to check out. Sand: Sand is another commonly used material and it also provides a nice striking experience. Sand can occasionally settle on the bottom, which can make the bottom of the bag a little harder to hit than the top. Pockets can also occasionally form in sand bags. This isn’t usually a big deal if you buy a high-quality bag, but it is something to consider. Water: We really like water filled heavy bags as they provide a consistent experience and feels more natural to strike than any other bag. However, this is just a personal preference and not everyone has the same opinion. If you are looking for a good bag that uses several of the materials, then definitely check out the Everlast C3 Form Heavy Bag which uses, fiber, foam and sand in it’s design. Hopefully this article has given you the basics on choosing a heavy bag. For more information, make sure to check out the reviews on this site before buying a bag. You can also take a look at our interactive punching bag chart to learn more about the different heavy bags that are available. If you have any questions about how to choose a good punching bag don’t hesitate to contact us. We are always happy to answer questions about MMA and martial arts equipment. After you get your heavy bag you can also check out our heavy bag drills for some good practice tips.